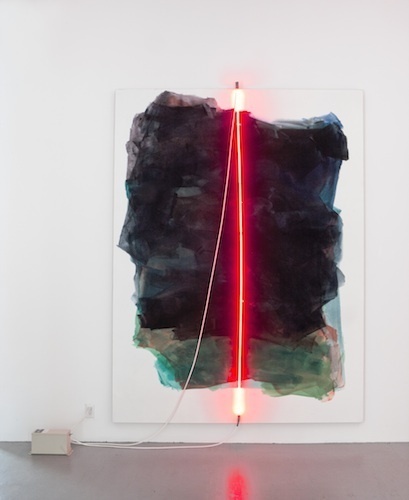 Mary Weatherford, Empire, 2012, Flashe and neon on linen, 105 x 79". Los Angeles–based artist Mary Weatherford is quite the mistress of illusion—or allusion, as it were. Through her adept utilization of a variety of techniques and material manipulations, she conjures a phantasmagoria of postwar artistic references—from Helen Frankenthaler to Lucio Fontana, and Dan Flavin to Barnett Newman—while also imprinting her own point of view. Her current exhibition, “Manhattan,” consists of a series bearing the same title: five mixed-media painterly impressions of New York City rendered from memory. Weatherford has a long history in the city: She attended the Whitney Museum’s Independent Study Program after graduating from Princeton in 1984, and she lived in New York until 1999. Since then, she has lived in Los Angeles, and has spent the greater part of the past decade exploring the tactile quality of her chosen medium, Flashe on linen. Her new works depict her evolution in materiality and experiments in recall. Take, for example, Empire (all works 2012), where the washed-out gradients of dusky teals and rosy blush are absorbed and contained by the linen canvas while a darker black wash veils the body of the brushstrokes. A bright and garish latitudinal inroad of thin smutty-red neon lighting, stretching beyond the painting to the naked top and bottom of the canvas, bisects the work. The electrical line hovers on top of the paint, calling to mind the spire on top of the Empire State building; the rest of the details of this urban scene have apparently fallen casualty to Weatherford’s memory. The sparseness of the paint in “Manhattan” when engaged by the various neon incursions—including the fixtures’ white electrical cords, which hang bare from the works—produces the sensation of a hazily familiar New York, evoking the seedy Times Square of the 1970s in Midnight Cowboy. In Weatherford’s jubilant piece Chinatown a blue neon bar at the bottom exalts and intensifies the artist’s cacophonous memories of a vibrant city.